After a cancellation due to weather in September, the boys were chomping at the bit get offshore with Incredible Fishing Charters. The trip ended up being on 21 October 2012. Again it was touch and go with the weather, but Brendon the skipper made a great call. We ended up having a sleep-in and departing at 9am by which time the wind had all but dropped off. There were 8 anglers on board with 3 staff. In addition to Brendon was Ben the deckhand and Keith Hall who is well known in the Brisbane fishing community. It was great to chat with Brendon and Keith on the way out. The steam out to Caloundra Wide fishing grounds from Scarborough was about one hour. Incredible Fishing Charters supplied quality overhead reels with braid. Plenty of squid, pilchards and mullet was made available for the overhead rigs. We packed a couple of 9 kg graphite rods with eggbeaters and 9kg braid. The charter supplied soft plastics for the 9kg rods. The rigs and bait were all ready to go by the time we arrived at Caloundra Wide. The first drop was in about 60 metres of water and did not take long to produce. Some reasonable Pearl Perch came up to the boat, the bulk of them on squid. We moved to about 70 metres of water and along with the squid, the soft plastics began to produce. 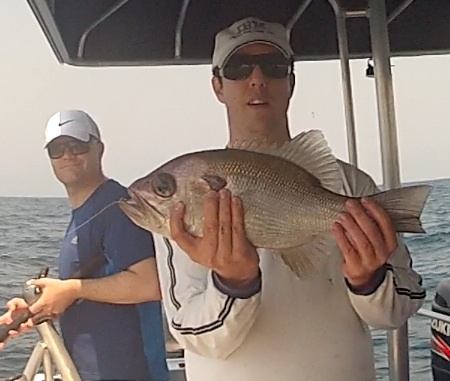 The nicest Pearl Perch landed was 48cm and pictured. We moved on to Yellowtail Kingfish territory in about 30 metres of water. Jono was onto a nice fish which had taken a soft plastic, so it was lines up. The drag was getting a great workout on the 9kg rig. Twenty minutes later we had a 7.2kg Yellowtail Kingfish on the boat and Jono was looking to recover with a cold beer. Nice fish Jono. Then it was my turn. I hooked up a solid fish, again on soft plastics, again on the 9kg rig. It was hard to get line back off this fish. 10 minutes into it I hadn't made much ground. 20 minutes into the fish got a look at the boat and ran twice taking yet more line. 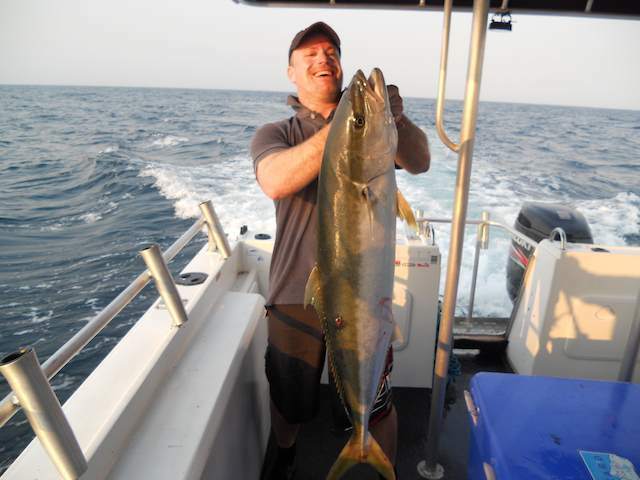 Eventually after 30 minutes I got a nice Yellowtail Kingfish in the boat, weighing in at 8.2kg. By the time this fish was in the boat, it was almost sunset so we headed back to Scarborough. A great day was had by all. Two anglers rated the day out as a 5/5 affair. The facilities were excellent, the service was excellent and the fishing speaks for itself. The staff were very knowledgable and bent over backwards to make sure we got the fish in the boat. All the events described can also be seen on the YouTube video footage of the trip. Incredible Fishing Charters operate out of Scarborough Brisbane QLD Australia. They fish offshore grounds including CALOUNDRA WIDE, EAST OF CAPE MORETON, DEEP TEMPEST, HUTCHIES, FLINDERS, SMITHS, ROBERTS and SHALLOW TEMPEST. For those that don't know, Scarborough is about 40-50 minutes drive north-east from the centre of Brisbane QLD Australia. Incredible Fishing Charters depart SCARBOROUGH BOAT HARBOUR, THURECHT PARADE, SCARBOROUGH. The boat comfortably takes 8 anglers offshore and is powered by two 200hp engines. The fishing area is custom build for fishing with no poles to worry about. There is a toilet and fridge on board.